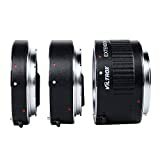 Auto Focus extension tube, designed for for Canon EF/EF-S 35mm lens to shoot at closer distance with higher magnification. With camera of TTL,AE(through-the-lens, automatic exposure)type it gives perfect coupling except when combined with electronic flash AE unit. Combined with 3 tubes in different length: 12mm, 20mm, 36mm, can be used in any combination or individually to obtain the different magnification. With camera of TTL,AE(through-the-lens, automatic exposure)type it gives perfect coupling except when combined with electronic flash AE unit. Auto Focus extension tube, designed for Canon EF/EF-S 35mm lens to shoot at closer distance with higher magnification. Combined with 3 tubes in different length: 12mm, 20mm & 36mm, can be used in any combination or individually to obtain the different magnification. With camera of TTL, AE (through-the-lens, automatic exposure) type it gives perfect coupling except when combined with electronic flash AE unit.